Most people associate concussions with a single, violent blow to the head, such as the kind of split-second, crushing hits that football players endure on the field. Many believe that hits to the head are nothing to worry about if they don’t induce symptoms of concussion. But research in recent years says something quite different: Receiving many less severe hits to the head over time may be even more dangerous to the brain than a single concussion. The long-term impact from repetitive hits can be quite serious, says neurologist Andrew Russman, DO. “There’s some increased concern that impacts to the head that do not result in a concussion may not be as benign as many people think,” he says. For example, a 2011 University of Rochester Medical Center study reported that brain scans of high school football and hockey players showed subtle injury after the players took routine hits to the head during the normal course of play. The study compared brain scans from players before and after the season. This damage occurred even though all of the players except for one did not have a concussion. These and other findings are of special concern for younger athletes whose brains are still developing, Dr. Russman says. Injuries for young athletes puts them at greater risk of incurring lifelong neurological effects. Changes in rules that cover routine activities at the youth, high school, collegiate and even professional levels should reduce exposure for athletes from the repetitive injury that experts are most concerned about, Dr. Russman says. For example, the U.S. Soccer Federation has instituted new guidelines that govern heading the ball among young soccer players. Changing the way athletes practice is just as important as regulating what happens during the game, Dr. Russman says. A recent study found most injuries to the brain actually happen during high school and college football practice — not during games. “The number of contact practices increases the risk of concussions that may occur, in practice and in competition environments,” Dr. Russman says. A concussion is a mild traumatic brain injury caused by a bump, jolt, or blow to the head. The sudden movement causes the brain to bounce around or twist inside the skull. This leads to stretching and damaging of brain cells and chemical changes in the brain. A jolt to the body also can cause a concussion if the impact is strong enough to cause the head to forcefully jerk backward, forwards, or to the side. A concussion is classified as “mild” because it is not usually life-threatening. However, the effects from a concussion can be serious and last for days, weeks, or even longer. Football, rugby, hockey and soccer are the high school sports with the greatest risk of concussion, the American Academy of Neurology (AAN) says. 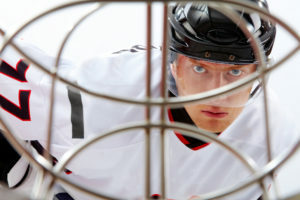 With any concussion, timely diagnosis and prompt treatment are crucial for recovery and to help prevent more serious potential complications, Dr. Russman says. Athletes must be 100 percent symptom-free before returning to play.